Antifreeze emerging from the tap. Not winterizing your boat’s freshwater and sanitation systems runs the same risk as not winterizing your boat’s engine. Unless all water is removed and replaced with antifreeze, you run the risk of a freeze destroying water lines and equipment. Winterizing your boat’s freshwater system is a simple process, which can be broken down into three steps. If your boat has a water heater, we we suggest installation of a Water Heater Bypass Kit, which isolates the water heater, so you can drain it separately and forego the cost of filling it with antifreeze. If the water heater, like most, is electric and relies upon an internal heating element, you should disconnect it from the electrical system before you drain it. This will ensure that the heating element does not burn out, which it will if the heater is left turned on when empty. Be sure to mark the electrical connection with a note to remind you that the water heater needs to be refilled before restoring the connection in the spring. 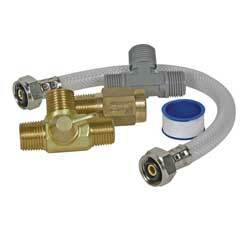 Water Heater Bypass Kit saves time and money by eliminating need to fill water heater with antifreeze. Also, if your water system has an accumulator tank, you will need to drain it by removing the hoses. 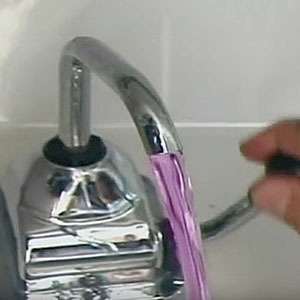 If it fails to drain, blow through the T connection to force the water out or remove the tank and shake any trapped water out. Then replace it and reconnect the hoses. Open all faucets and turn on the freshwater pump. Allow the faucets to run until the freshwater tank is dry, then close all the faucets and turn the pump off. 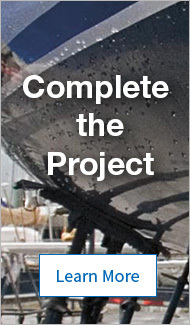 Pour four to six gallons of West Marine Pure Oceans non-toxic antifreeze into your boat’s potable water storage tank. Turn the pump on and open the hot water fixture farthest from the pump. This will cause antifreeze to flow to the hot water heater and to the hot water fixture. When you see antifreeze coming out of this fixture, turn it off. Next, open the corresponding cold water fixture, wait until you see antifreeze coming out, then turn it off. Repeat this procedure for all fixtures on the boat, working your way back to the fixture closest to the pump. Don’t forget the shower. When finished, turn the pump off. By following the procedures outlined above, you will assure that your boats freshwater delivery systems will function properly in the spring. There are two types of antifreeze. The first is common automotive antifreeze, such as Prestone, which is ethylene glycol. 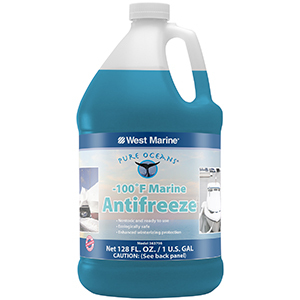 This type of antifreeze is highly toxic and should not be used for winterizing applications on boats. In place of ethylene glycol, use non-toxic propylene glycol, like our Pure Oceans brand. For northern regions where the mercury can drop below zero, we recommend antifreeze with a freeze rating of at least -100°F. Why use -100°F antifreeze when the temperature never goes below -50°F? The answer is that what goes into the system as -100°F antifreeze, does not come out as -100°F antifreeze. There is always some residual water that lowers the concentration of antifreeze, so the resulting freeze point may be much higher than the rated temperature. The small cost difference between the -50°F, -60°F and -100°F antifreeze is a bargain for the peace of mind you get knowing that your systems will be safe, no matter what the weather. For more information on antifreeze, click here. One other point: Even though Pure Oceans propylene glycol antifreeze is non-toxic, best practice dictates that you not discharge it on to land, into storm drains or directly into the water. After use, dispose of used antifreeze in a manner consistent with federal, state and local regulations.